The Arizona state centennial exhibit “100 Years, 100 Quilts” opens this Satrday, February 18, 2012, at the Arizona History Museum, 949 E. 2nd Street, Tucson, Arizona. 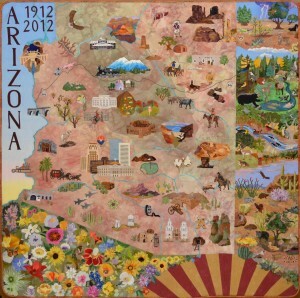 Years in the making, the show illustrates Arizona through the fabric artist’s eye, and many will be amazed at the extraordinary artistry and quality of the works on display. 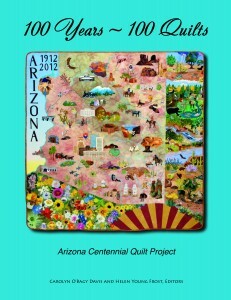 The project began when a group of quilt historians and enthusiasts realized a few years back that the Arizona state centennial was approaching. 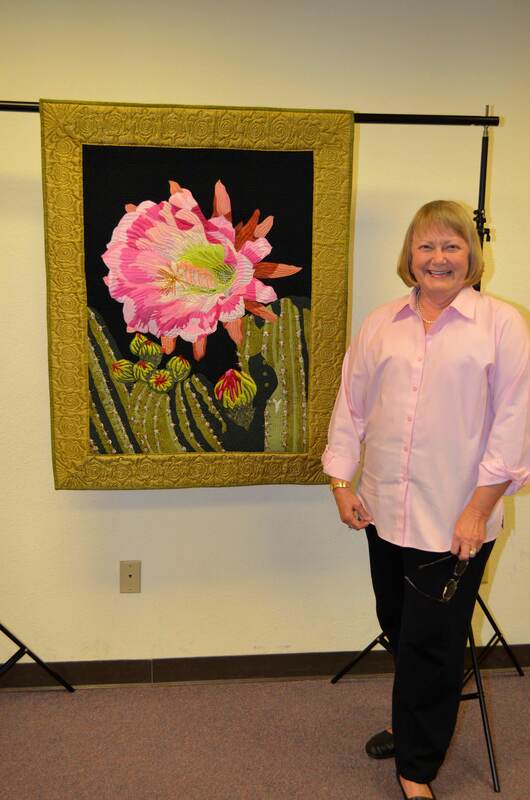 They wanted to celebrate the occasion with an exhibit of the far-reaching talents of the state’s widespread quilting community. 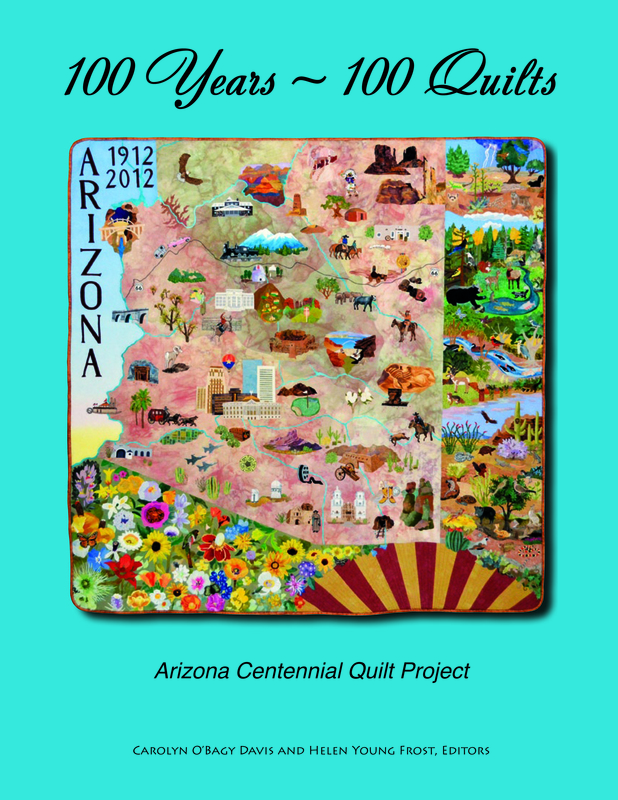 They formed an organization called the Arizona Centennial Quilt Project (ACQP) and teamed up with the Arizona Quilters Hall of Fame to turn that germ of an idea into a reality. 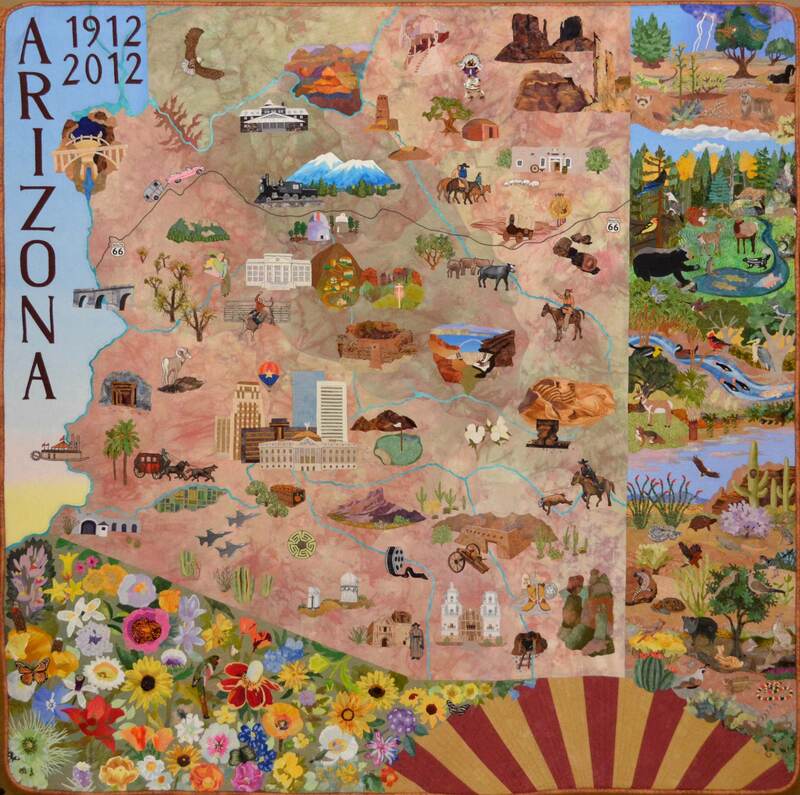 Initially they envisioned the creation of 100 original-design quilts on Arizona themes, which would be farmed out in smaller groups to a variety of locales around the state. But when they spoke with the Arizona Historical Society about becoming one site for the show, AHS counter-offered to house the entire show in its Tucson museum so that viewers could take in the entire collection. ACQP members liked the idea and a deal was struck. Notice was sent out through statewide quilt guilds, newsletters, related media and in quilt shops that the show was coming. Though the work was not juried, only the first 100 quilts that met the criteria for originality, size and deadline for completion were accepted. In addition to photos of the quilt, those entering had to provide a legacy statement about their idea for the quilt and their feelings about being an Arizona quilter. In addition, a special centennial fabric was commissioned and created, and a giant centennial commemorative quilt (seen above) was designed and executed on by a crack team of quilters from around the state. 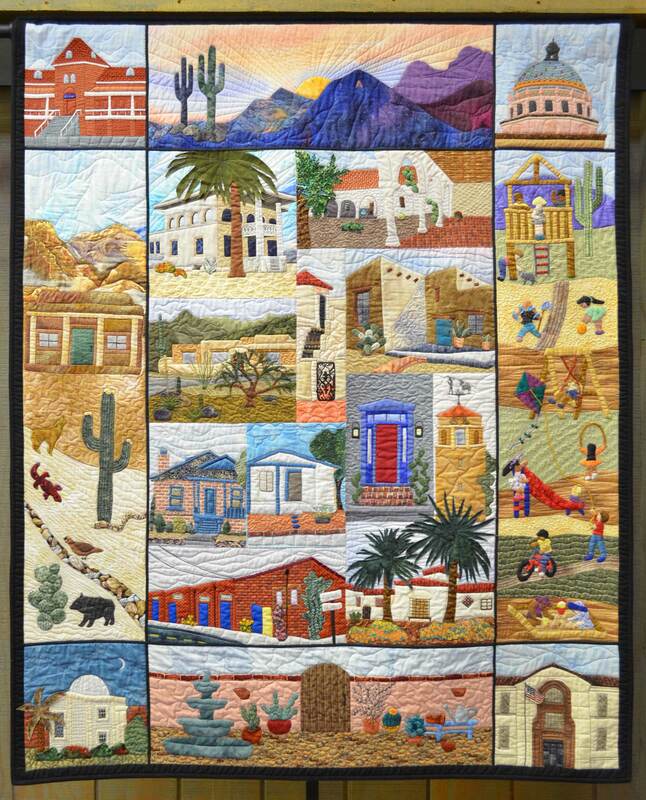 Documentary maker and former Tucson Citizen newspaper writer Daniel Buckley was contracted in September of 2011 to capture video of the process from the time quilters started dropping off their work at AHS offices in Tucson and Tempe, as well as Prescott’s Sharlot Hall Museum. In addition he was to photograph the works by themselves and with the quilters, and to videotape interviews with 13 of the show participants for monthly 5-minute portraits throughout the centennial year. The first of the 5-minute portraits, on Surprise, Arizona quilter Alicia Sterna, is up for viewing now. From those materials and interviews with the shows creators and partners, as well as footage shot during the hanging of the show, Buckley created a half-hour documentary film to be played during the exhibit, and was cast as a DVD for sale through AHS. 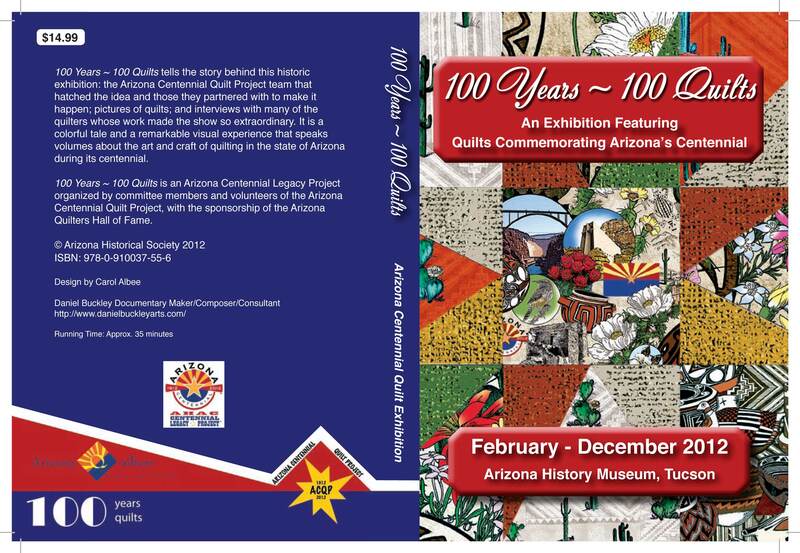 In addition his photos were used, along with the legacy statements provided by the quilters, for a book on the exhibit, also on sale through AHS. But there is no substitute for being in the physical presence of these historic and artistic quilts, drinking in for yourself the richness of texture, pattern and color that tells 100 stories of the state, today and in the past. 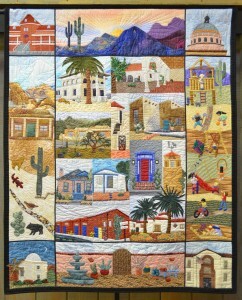 Please come and see for yourself the beauty of Arizona through the quilter’s eye. For more visit Daniel Buckley’s quilt project blog. ~ by Daniel Buckley on February 16, 2012.